Jeff For Banks: Does your bank achieve positive operating leverage? Does your bank achieve positive operating leverage? When a significant portion of your cost structure is fixed, then growing revenues should generate positive operating leverage... the cost of generating the next $100 of revenue should be less expensive than generating the previous $100. This fundamental logic stands behind the banking industry buzzphrase, economies of scale. The fixed cost of your IT infrastructure is less on a relative basis for a $1 billion in assets financial institution (FI) than a $500 million in assets FI. Because it is intuitive, doesn't make it so. 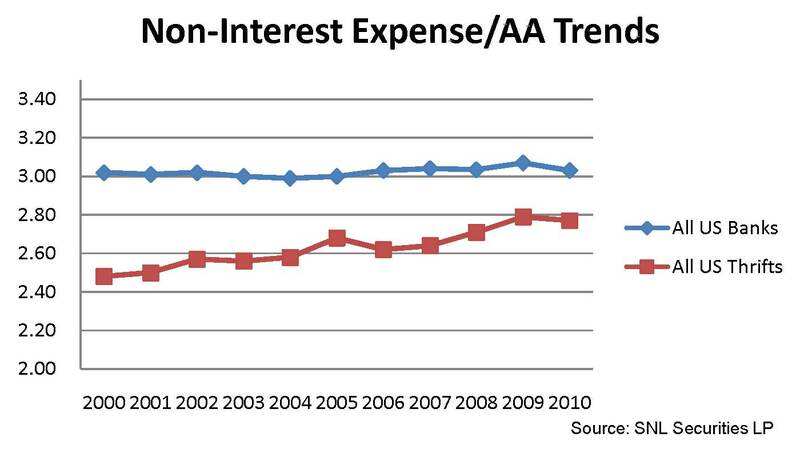 Over the course of the past 10 years, the number of FDIC-insured FIs decreased by 23% (see chart). The average asset size per institution increased from $753 million to $1.7 billion. Clearly, part of this consolidation wave was attributable to FIs striving for economies of scale and positive operating leverage. Has this consolidation, partly designed to give surviving institutions scale so they can spread relatively fixed costs over a larger franchise, resulted in positive operating leverage? My research into the subject says no. One measure of achieving positive operating leverage is the efficiency ratio, defined as operating expense divided by the result of net interest income plus fee income. 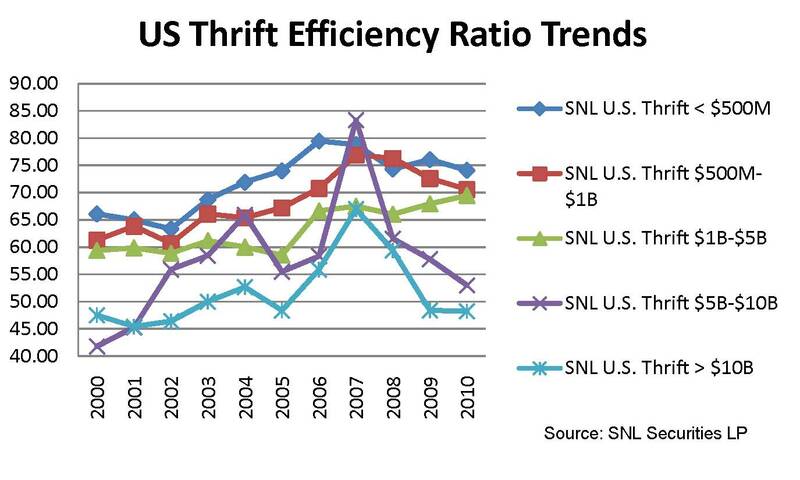 The lower the efficiency ratio, the greater the profitability. As an institution grows and is able to spread costs over a larger base, the efficiency ratio should go down. 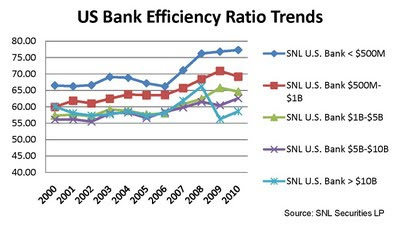 But over the past ten years, efficiency ratios have risen in every asset category in both banks and thrifts with the exception of the very largest (>$10B in assets) banks (see charts). The efficiency ratio measures how much in operating expense it takes to generate a dollar of revenue. 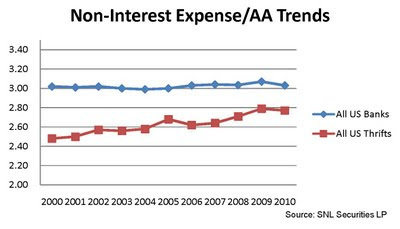 So what if revenues (net interest margin, or fee income) are on the decline? Naturally, the efficiency ratio will go up. To further isolate expenses, I reviewed how expense ratios, defined as operating expenses divided by average assets, fared for our industry (see chart). 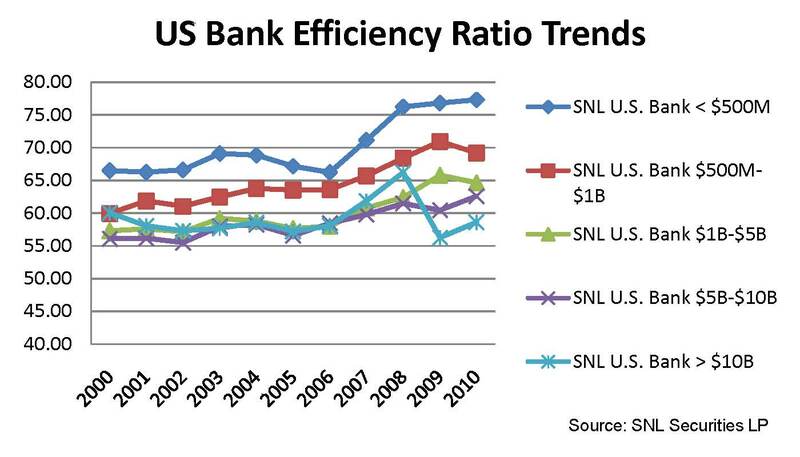 For banks, expense ratios have not budged during the period that resulted in a 23% reduction in FIs. 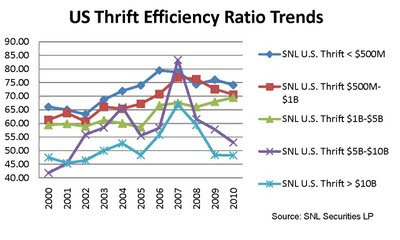 Thrift expense ratios rose materially. I reviewed my company's bank and thrift product profitability reports to see if operating expenses per account declined during the 2000-2010 period. The answer: not one spread product group showed a decline in annualized cost per account. Not one. Let's look at a couple of highly acquisitive FIs to see if they are achieving positive operating leverage by growing their balance sheets through mergers. 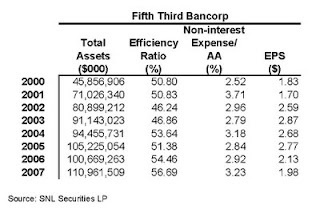 While Fifth Third’s assets grew at a compound annual growth rate (CAGR) of 13.5%, earnings per share grew at a 1.1% CAGR and both the efficiency and expense ratios were higher in 2007 than when the bank was $45 billion in assets in 2000. Positive operating leverage should result in EPS growing faster than asset size because adding the next $100 in assets should cost less than the previous $100. Has Fifth Third achieved positive operating leverage by more than doubling the size of the bank during the measurement period? 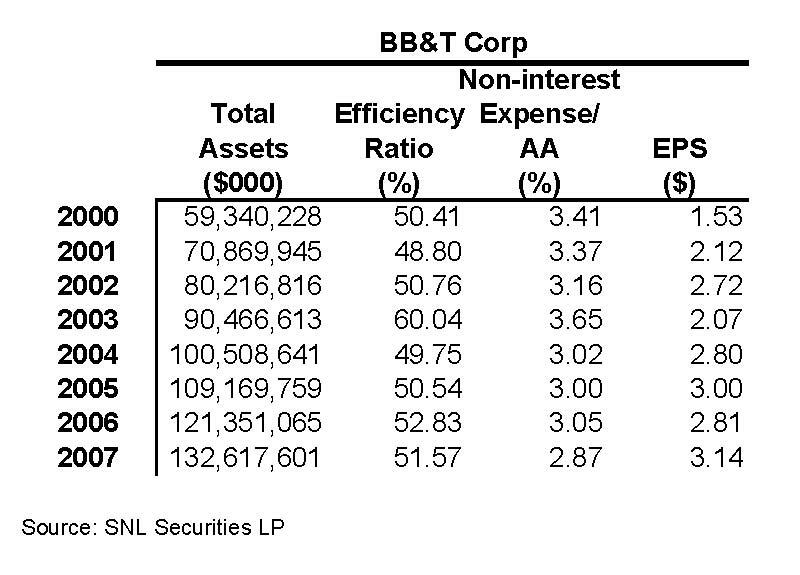 While BB&T’s assets grew at a CAGR of 12.2%, earnings per share grew at 10.8%. 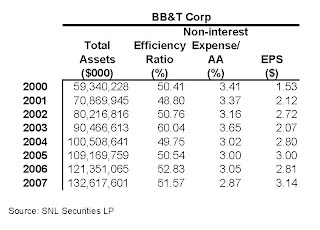 But the efficiency ratio remained relatively steady in spite of BB&T’s net interest margin falling from 4.20% in 2000 to 3.46% in 2007. The expense ratio declined, realizing economies of scale from its asset growth. Although EPS did not exceed asset growth, the culprit lies more in revenue generation than on realizing efficiencies from growth. This analysis is a simple undertaking to determine if your financial institution is getting the results you want when executing a growth strategy to achieve economies of scale and positive operating leverage. 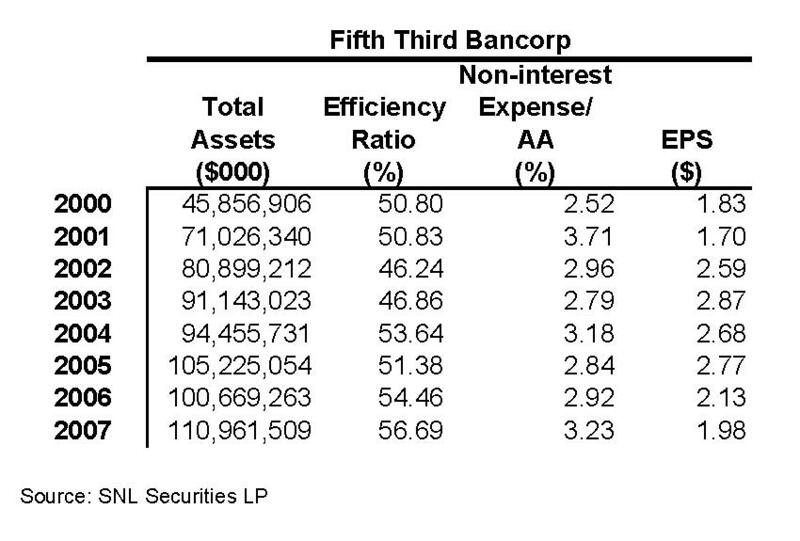 If your results more closely resemble Fifth Third’s than BB&T’s, you should ask yourself why. Economies of scale should result in lower efficiency and expense ratios, and greater profitability… i.e. positive operating leverage. If you are growing to spread relatively fixed costs over a greater revenue base, then you should measure to determine if you are succeeding. Success should result in better results to peer, industry benchmarks, and downward trends in operating costs per account. Growing absent success in these metrics means you are simply managing a more complex organization for no additional benefit. Do you measure and hold yourself accountable for reducing relative costs as you grow? Note: The above post was excerpted from a soon to be published Financial Managers Society (FMS) white paper drafted by the author. a great article I have shared with my board..would love to see the progress, or lack thereof, that banks have made over the span of time that has passed since this article was written.